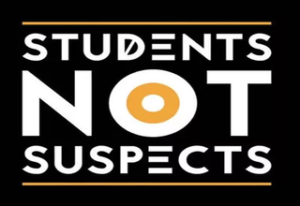 PREVENT is a reality on all of our campuses. 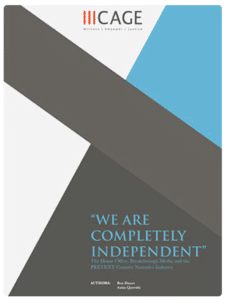 It shapes much of our engagement with our institutions, in particular our ability to hold events and run campaigns. This briefing provides some guidance on how to deal with PREVENT infringing on our right to organise and being used to clamp down on events. On a home visit to a family, a healthcare professional noticed a child sitting in front of an Arabic televised news channel. There were also Arabic reading materials lying around. 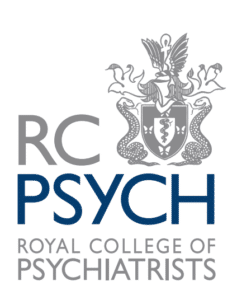 The family were reported to social care as a potential case of radicalisation. The case did not reach Channel. Predicting very rare events is extremely difficult. No tools have been developed that can reliably identify people who have been radicalised, who are at risk of radicalisation or who are likely to carry out a terrorist act. Assessment of risk is therefore best done on a case-by-case basis, as part of professional safeguarding practices. 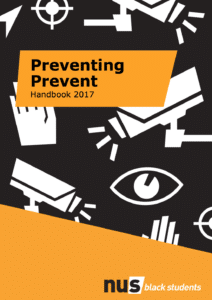 80 per cent of ISoc president respondents agreed or strongly agreed that the Prevent duty has had a negative impact on their society, with some commenting a decline in membership due to concerns of surveillance by authorities. Our research suggests that the most problematic elements of CVE frameworks are indeed being transposed and adopted uncritically. Deeply flawed, problematic and controversial policies are being globalised, sanitised and presented as highly effective best practice and – despite the lack of evidence to support their global take-up – then backed with substantial amounts of funding and technical assistance. 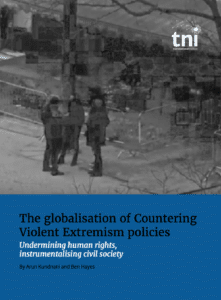 We repeat our previous call for an independent review of the Prevent policy in our report on Counter-Extremism; we consider any such review should include an assessment of the Prevent duty’s effectiveness in Higher Education and its impact on freedom of speech and association. 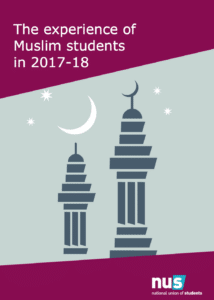 An atmosphere thick with anxiety hangs over Muslim communities, whilst the chilling effect of Prevent is felt throughout academia and organising spaces alike. 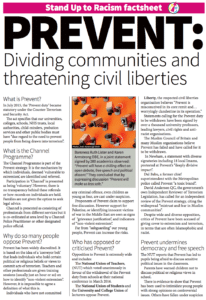 With Prevent, there is no space spared from the spectre of state surveillance. 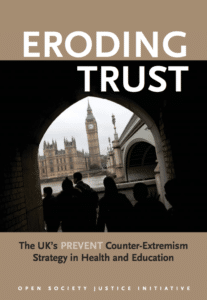 Under the guise of ‘countering extremism’, it has been embedded across society, spanning our nurseries, schools and colleges, through to GPs and prisons – seeping into the immigration system and even the home. Prevent emerged in, fed off, and in turn nourished an expansion in anti-Muslim racism to strengthen the state’s hand and amass more powers of repression. 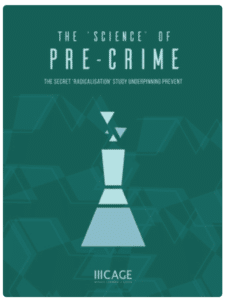 This CAGE report, details for the first time how the government produced these factors in secret, and subsequently relied on an evidence base that was not only unproven, but extended far beyond its original remit. Key among our findings, is the admission by those who wrote the study, that they did not factor political grievance into the modelling, a fact they say was, “perhaps an omission”. 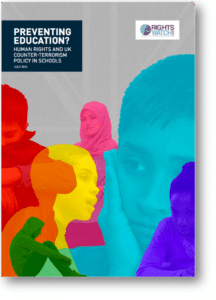 Open Society Justice Initiative publication: The report concludes that the strategy creates a serious risk of human rights violations and is also counterproductive. 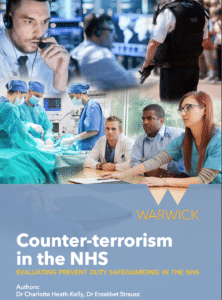 It argues that its application in schools, colleges, and healthcare institutions is damaging trust: between teachers and students; between doctors and patients; and between the police and members of the UK’s Muslim community, whose support is an essential element of counterterrorism efforts. 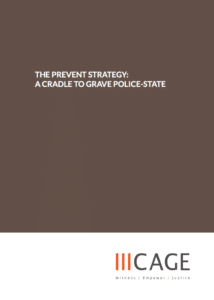 The Prevent strategy as currently structured and implemented is untenable. The strategy in this country’s schools needs to be abolished, and the government needs to reconsider how it approaches preventing terrorism. beyond Europe. Te US presidential candidate, Donald Trump, wants to ban Muslims from entering the US. Islamophobic hate-crime is rising, particularly against Muslim women.